Given the power of Bax’s symphonies and tone poems, it is easy sometimes to forget the equal mastery of his major piano and chamber works, let alone the best of his countless productions for the human voice. Hearing this excellent new recording of Bax’s major unaccompanied (or in one case, slightly accompanied) choral pieces is a reminder of their quality. Two of them – the magnificent Mater Ora Filium (1921) and the even more incisive This Worldes Joie from the following year – are among his very greatest compositions, despite their comparative brevity. Or perhaps I should say, because of their brevity. It’s hard to recall any full-length, formal requiem which hammers home the direct despair of humanity in the face of death with more force than This Worldes Joie, which discloses its medieval horrors in a mere seven minutes. Mater Ora Filium, more like a Russian liturgy in its contemplative beauty, intercuts simplicity and dazzling complexity to accumulate overwhelming power: everything here is about the glorious sound, not the Christmas images of the text itself. The Carice Singers, founded in 2011 by their conductor George Parris, are new to me; but given the vigorous quality on offer here, I am keen to hear more. The verbal and tonal clarity Parris achieves provide constant pleasure. Their Naxos programme is well chosen, the Bax items prefaced by a Delius group containing some unusual (if slight) Schumannesque rarities from his early career as well as that perfect chip from the pantheistic master-block On Craig Ddu (1907) and the well-known pair of wordless tone poems which constitute To be Sung of a Summer Night on the Water from a decade later. I was particularly struck this time around by The Splendour Falls on Castle Walls. 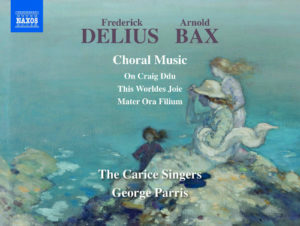 Given Delius’s congealed choral harmonies and rhythmic stasis this late song – largely dictated by the blind composer to his wife in 1923 – can seem glutinous compared against Britten’s limpid setting of Tennyson’s text in his Serenade, but here it sounds light and fresh as mountain air. The Carice Singers’ wordless rendition of “the horns of Elfland faintly blowing” really does evoke Delius’s miniature bugles with bold, charming fidelity. This same youthful freshness and imaginative response to words marks the substantial Bax selection which follows. Two of these have been but rarely recorded: the Five Greek Folksongs are otherwise only currently available from Paul Spicer’s Finzi Singers in their Bax/Howells compilation on Chandos. Of a Rose I Sing a Song, with its subtle, French-style underlay for harp, cello and double-bass, does not seem to have had an outing since the BBC Northern Singers’s cherished Hyperion LP from 1983 – unaccountably never issued on CD – under Stephen Wilkinson. That disc also features the Five Greek Folksongs from 1942, but on repetition I found myself preferring the brio of George Parris’s team to the more seasoned Northerners and the intelligent but somewhat detached Finzis. Here, the Carice Singers’ attention to the texts is their trump card, the onomatopoeia of St Basil’s Bells in the last of the set A Pilgrim’s Chant zestfully conveyed, the sweet innocence of The Bridesmaid’s Song touchingly so. The whole set emerges as more substantial than I’d remembered. This Worldes Joie has been heard more often on disc, and here I feel the Carice Singers fall short of Wilkinson’s smaller unit. Their spitting emphasis of Bax’s staccato marking at the first appearance of “All we shall die, though us like ill” as it pierces the winter reverie certainly makes us sit up sharply, but the climax arrives too soon, leaving the performance nowhere to go when we get to the final, astonishing outburst of “Jesu help”. With their subtle rubato, dynamic shading and inexorable turning of the screw to that final cry, the Northern Singers have the edge here. So do the boys and men of King’s College, under David Willcocks on EMI. There is something about boys’ voices uttering those desolate phrases which is almost unbearably moving. Discussion of Mater Ora Filium is complicated by the fact that very few of its (many) recordings have used the large chorus Bax obviously had in mind, given his multiple and shifting divisions into two choirs, semi-choruses, “six voices”, “three solo voices” and “a few voices”. In most recordings “a few voices” is all we get, and by involving thirty-four singers the Carice Singers is at the higher end of the spectrum numerically (and very close to the head count of the work’s creators, Charles Kennedy Scott’s Oriana Madrigal Singers, which was thirty-six). Once again, I warmed to the Carices’ freshness and energy. On the whole the sound is beautifully blended, although there is a suspicion of strain when the sopranos reach Bax’s higher stratospheres, notably his almost impossibly elongated Top C at the work’s central peak. The sheer difficulty of the writing is also slightly evident in the high-lying tenor parts. In the final analysis these small flaws matter far less than the performance’s bright musicality and Parris’s care for balance, all naturally captured by David Hinitt’s engineering at Oxford’s St Michael and All Angels. It is a joy throughout to hear consistently well-trained young voices in such supremely demanding yet rewarding music. The Carice Singers, George Parris. Frederick Delius: 1 On Craig Ddu (1907) 4:19; 2 Ave Maria (1885-87) 2:17; 3 Durch den Wald (1885-87) 2:42; 4 An den Sonnenschein (1885-87) 1:07; 5 Frühlingsanbruch (1885-87) 1:21; 6 Her ute skal gildet staa (1891) 2:18; 7 Sonnenscheinlied (1885-87) 0:50; 8-9 Two Unaccompanied Part-songs: To Be Sung of a Summer Night on the Water (1917) 5:01; 10 The Splendour falls on Castle Walls (1923) 3:33; 11 Midsummer Song (1908) 2:11. Arnold Bax: 12 This Worldes Joie (1922) 7:02; 13-17 Five Greek Folksongs (1942) 12:51; 18 Of a Rose I Sing a Song (1920) 7:59; 19 I Sing of a Maiden that Is Makeless (1923) 5:12; 20 Mater Ora Filium (1921) 13:00. Recorded at St Michael and All Angels Church, Summertown, Oxford, from 31st August to 2nd September, 2016. Producer: Jeremy Summerly. Engineer: David Hinitt.